I think there must be something unusual about the shape of my ears, because I have never been able to find a pair of ear buds that I can stand to wear for more than a couple of minutes. The ear buds that come with iPods sound okay, but they hurt my ears so much that my ears feel bruised after listening to only a couple of songs. Most ear buds with the silicone covers that fit into the ear canal don’t hurt, but I often find that even the smallest cover doesn’t fit in my ear very well. I was happy when Julie chose me to try out the Arctic Cooling E361-WM earphones. I was hoping they would prove to be the ear buds that would finally fit my ears and sound good, and I was excited to see they also had a built-in microphone that would allow me to use some of the capabilities of my touch I’ve never tried. I was horrified when the package was delivered to me from China. 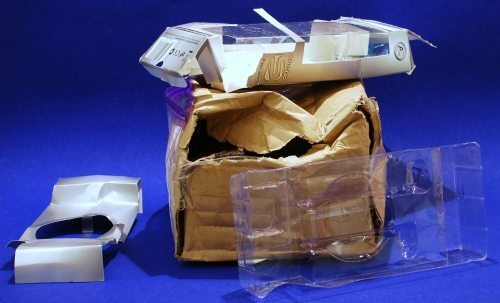 The shipping box was in such bad shape the delivery guy didn’t just chuck it on my porch and leave. He wanted me to inspect the package because it looked like it had been dragged behind the plane all the way from China. I stuck my hand in the ripped box and pulled out the Arctic-Cooling package inside. The cardboard part of the packaging fell off in my hand, but the ear buds themselves were still packed nicely in the formed plastic. I decided I’d give them a try. Because of the sorry state of the packaging, I did snag the top picture from the Arctic Cooling web site so we could all see what it was supposed to look like. The Arctic Cooling E361 ear buds are available in white or black. I was sent the white. 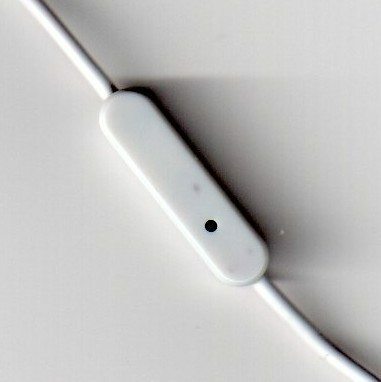 The 1.3 meter cable is long enough to reach your iPod in your pocket or in a bag, but not so long that it gets snagged on everything. 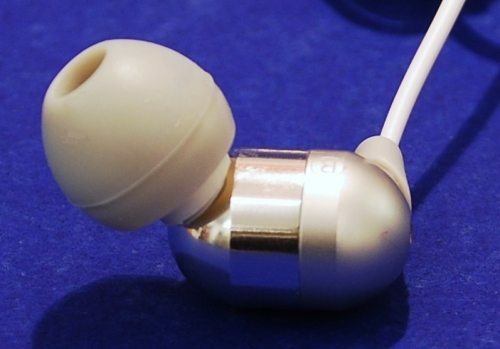 The ear buds are made of milled aluminum. The part closest to the ear is shiny aluminum, and the part where the white cable attaches is a brushed silvery color on my white ear buds. The black set has a black cable and a brushed anodized gray color where the cable attaches. One thing I really like about these ear buds is that both wires attached to the ear buds are the same length. (I really hate ear buds that have one short wire and one long wire.) 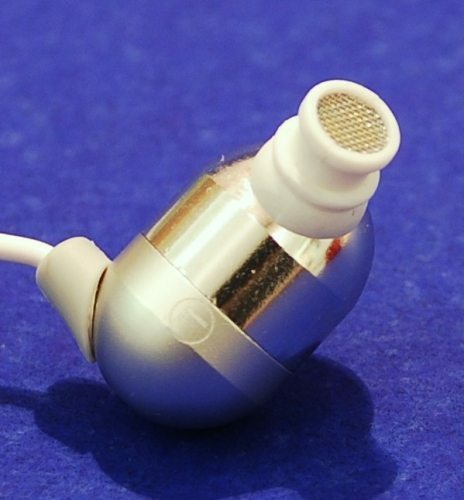 The wire for the left ear bud has a little in-line, lozenge-shaped plastic and metal microphone. The 3.5 mm stereo plug is gold-plated, and it is a right-angle style so it doesn’t protrude so far from the bottom of the iPod. First, how do they feel in the ear? A set of the silicone caps were already on the ear buds, so I tried those first. Not only did they fit well, but they felt very comfortable. I never forgot they were in my ears, but they never bothered me at all. Turns out the medium caps were preinstalled on the earphones, and they were a perfect fit. With other ear buds I’ve tried, even the small caps feel a little large for my ears. The Arctic Cooling medium cap is about the same size as the small cap with the Skull Candy Full Metal Jacket ear buds I have, and the large Arctic Cooling cap is about the same size as the Skull Candy medium cap. The ear buds stayed comfortably in my ears without feeling like I had crammed them half way to my ear drum. How do they sound? Using the Arctic Cooling ear buds, I’ve spent quite some time listening to music in iTunes on my computer, and I’ve listened to music on my iPod touch. Music sounds great. I don’t have any way to quantify, but I found them to have decent bass response and good medium and higher range sound, even when listening at very low volumes. Arctic Cooling documentation says the large drivers provide “deep bass and driving highs”. The bass didn’t rattle my head, but I’m way past the age where I would find this desirable. I did find that music on my touch sounds better than music on my computer. I think that’s because I don’t have the best sound card in my computer. 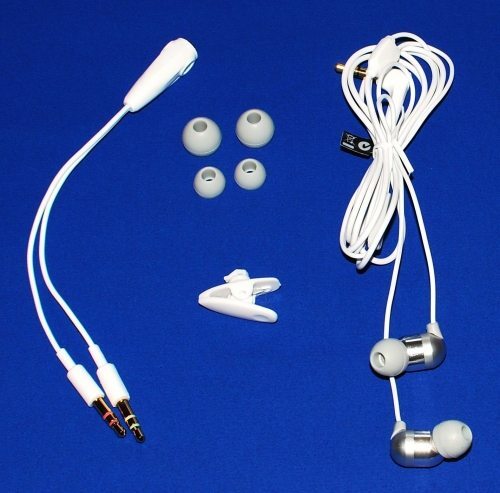 Documentation for the E361 ear buds says the silicone caps “minimize ambient noise and enrich bass response”. I could still hear ambient noise while listening to music. I could comfortably hear my television with the ear buds in my ears (no music playing), and I could still hear my television even while listening to music through the ear buds. I don’t think you should count on these to help you sleep on an airplane. The last thing to talk about is the storage case. 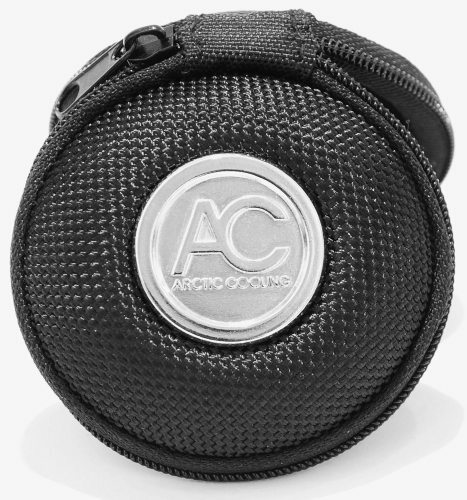 The round case is covered in a black, heavy-duty fabric. (It looks like those sturdy nylon fabrics used for luggage.) It’s about 2-5/8 inches in diameter, and about 1.25 inches thick. The top of the case has a silver-colored metal Arctic Cooling badge on top, and it closes with a zipper. The case is HARD – I think you could use it as a hockey puck! When you open it up, you see a trumpet-shaped center insert with slits in the side. You place the ear buds in the trumpet, bring the cord out one of the slits, then wrap the cord around the body of the trumpet. There’s even room to put the splitting cable around the trumpet and the extra silicone caps inside the trumpet. 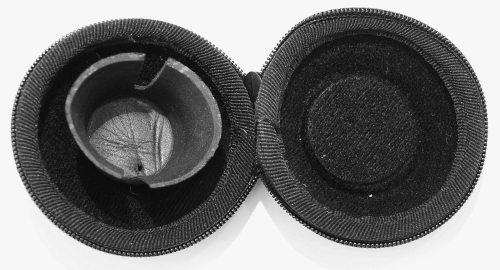 Your Arctic Cooling ear buds are going to be safe in this small case. I like the Arctic Cooling E361 ear buds. They fit my ears well, and they are more comfortable than any other ear buds I’ve tried. They have good sound reproduction, and they have a microphone – something I’ve been wanting for use with my iPod touch for quite some time. These ear buds have a permanent place in my bag! The Arctic Cooling E361 earphones and microphone worked great, and they’ve gone right back into my gearbag. JC — how are the buds after they’ve been in place after an hour or two? @Cobin Rox I don’t tend to wear ear buds for really extended periods. I’d say an hour was the maximum time I had these buds in my ears, but they always were comfortable.